We rate the HelloGold project at “Positive”. The documents are executed accurately and clearly; it is an excellent example for other companies regarding documentation. HelloGold is a platform for investments in gold. The staff consists of experienced and qualified specialists in the gold market. MVP has already launched. The white paper is clear and accurate; all decisions are explained. The financial model is unusual in our opinion, but implementable. HelloGold is an infrastructural platform where users are able to invest in gold using mobile applications. One of the most important advantages of the project is the ability to buy gold without needing to open bank and brokerage settlement accounts. Minimum purchase amount is $0.25. The price is fixed at spot-rate + platform charge. 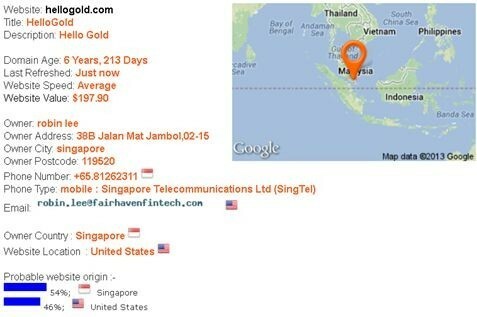 The HelloGold company was established in 2015; the registered office is in Kuala Lumpur, Malaysia. HelloGold is carrying out an ICO to enlarge its business activity and enter new territories. During the ICO they will sell HGT tokens; in addition there will be GBT – gold backed tokens. These are granted to HGT token sale participants at an amount equal to 3,800 kilos of gold. ICO Period: There are three stages for the token sale. 1st stage – August 28, 2017 – October 02, 201704:00 GMT. Other two stages are in 2018 and 2019. Total issue: 1,000,000,000 HGT. All tokens are issued within the first stage of the sale. 100,000,000 HGT – ICO expenses, community expenses, for development, scientific researches, and other expenses. To participate in the Public Sale, supporters will need to have registered on Hellogold.org, including submitting KYC data for approval by HelloGold. HelloGold gives users opportunity to invest in gold using mobile applications, at competitive prices close to the prices of stock exchanges. The company undertakes to buy physical gold using the investors’ funds. The gold will be kept in a secured safe box in Singapore satisfying international standards and requirements. BullionStar is a counterparty to the deals. As a result, users are able to receive the purchased gold or let it for rent. One of the advantages for investors is the minimal transaction value; it is only 1 Malaysian ringgit. This is about $0.25 at the time of writing. So HelloGold enables a large number of people to store and diversify their savings. At time of writing the HelloGold mobile application is available only in Malaysia. It should be adapted to the specific legislation, language and payment systems for launch in other countries. This is one of the reasons for carrying out the ICO. Another is the launch of the Gold Backed Tokens Program. This gives people worldwide a chance to enter the HelloGold platform. The project issues 2 kinds of tokens: HGT and GBT. The number of HGT tokens issued is 1,000,000,000. This is allocated among investors, team and other purposes mentioned above. GBT tokens are a kind of ERC20 token. 1 GBT = 1 gram of 99.99% gold, stored in the safes of the BullionStar International Company, a HelloGold partner. These tokens are allocated in accordance with the rules mentioned in the white paper, and are distributed as remuneration for crowdsale participants at the HelloGold Foundation’s discretion. The ICO organizer is a Singapore company. GBT tokens are fractioned into 18 decimal places, so gold investments can be modest and possible even for representatives of emerging markets. 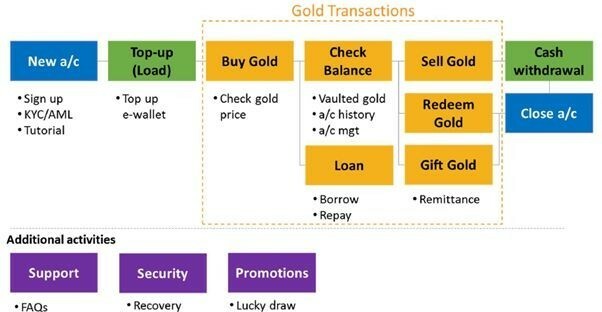 GBT tokens can be exchanged for physical gold using the HelloGold mobile platform after a KYC/AML procedure and the accrual of 1 gram minimum. MVP is active; the application is available for users to try out. It is a client-service system, a mobile application powered by iOS and Android and connected with the server where the clients’ database is processed and stored. Company staff examined blockchain technology usage and decided to delegate some processes onto the distributed Etherium blockchain registers. According to the developers this improves the security and reliability of the whole system. Delegated processes include storage of clients’ balances and fee estimation. Blockchain technological solutions make gold purchase and sale transactions more efficient. The Smart Contract Gateway manages the relationship between contracts and acts as a gateway to the other contracts in the system. The Bank contracts are a series of smart contracts, one per country in which HelloGold operates, plus functions to permit who can access and update this list. Users’ Accounts processes and records customer related transactions in a series of arrays within a smart contract. The Fee contract includes a list of tiers outlining the different fee structures that could apply to a customer. Each gift creates a new smart contract based on a template, with each contract implementing the movement of gold from account A to B, plus the status of that movement - complete, in progress, rejected (inc timed out). Each loan is represented by a smart contract and comprises an agreement between customer and agent. The staff ensures the transfer onto the distributed registers after examination of all contracts for efficiency. The transfer will not influence the system’s efficiency. According to the development plan this restriction will be cancelled in future, and the application will be available for everybody. The whitepaper is clear and detailed; all decisions are explained. The founders provide potential investors with all necessary information to understand the concept of the project and its development plans. In April 2017 HelloGold launched its mobile platform. This is active and available in the territory of Malaysia. According to the information given on the company website as for August 24, 2017 they manage 1618.699 grams of clients’ gold. This is about $66,963 according to the London Metal Exchange rate for the same date. There are 1000 non-zero accounts, so the average value of one user is about $670. Within the next three years HelloGold intends to launch a local mobile application in Thailand, the Philippines, and Indonesia. For this purpose they intend to achieve 35 million users and increase AUM to $42 billion by 2024. The project also intends to function in India, the Middle East, and Africa, but the founders do not describe action plans for these countries. After the Token Sale, the team will set the blockchain technology elements into their platform to adopt HGT and GBT tokens. According to the information given on the company website, HGT tokens are unlocked for sale at the end of October, 2017. The first GBT allocation is taking place in November of the same year according to the plan. HelloGold intends not only to enlarge the territory of its operation but also to augment its services to satisfy investor demand and the needs of clients with smaller incomes. It is planned that the platform will offer not only gold but other precious metals for sale. In addition the project intends to create a p2p system. This means every platform user can become a distributor. They can exchange gold for money and vice versa. They can provide financial services, for example, to refugees. HelloGold is a new channel for gold investments. There are many kinds of instruments for the purchase of precious metals; the main ones are described below. The first means of precious metal purchase is to buy physical gold – bullion. Standard bullion is produced in refineries meeting government and industry standards of particular jurisdictions or LBMA and LPPM standards. spread of the company selling/ buying the bullion. Additional expenses for storage in bank safe boxes or personal safe boxes. As a result, the profitability of bullion purchase is questionable. Another way to invest in precious metals, including gold, is via exchange traded futures dealing with gold or securities of ETF funds investing in gold. Brokers sell these instruments with a brokerage or stock exchange charge, which is not expensive. The upper line in the diagram represents a gold future delivered on August, 2018; the second one the XAO spot price. The diagrams are connected at the point of the expiry date. The future holder will have losses as to the difference between future cost and spot price. The losses are at denomination currency riskless rate. To avoid these mentioned losses, the investor can buy physical gold using ETF shares. The largest and most profitable fund is the SPDR Gold Trust (GLD); net assets cost is more than $33 billion. The investor pays a management fee to ETF at 0.4% per annum, and a brokerage charge for the shares’ purchase. There are no other expenses. This method is cheaper than future investments taking into account contango. It is important that GLD secures the ETF shares with physical gold bought in LME. There are ETFs showing gold being dynamic by 2-3 times more or less; these funds invest in derivatives. 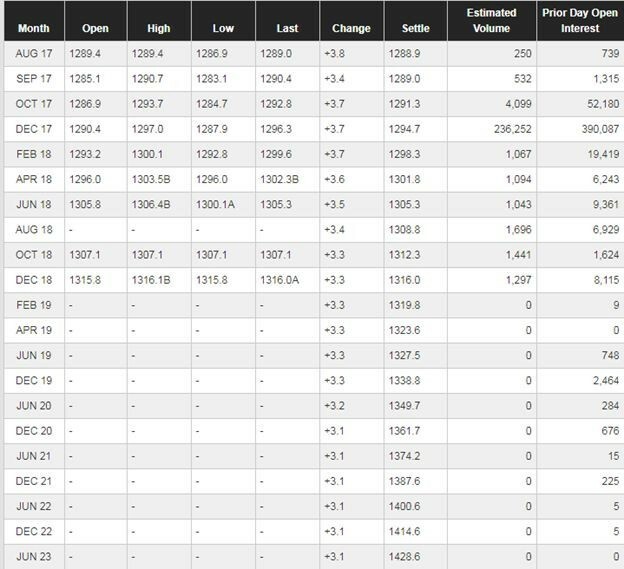 Contango takes place there as well; such funds are not profitable for investors, they are just short-term speculative instruments. Within a short period, the price of precious metal may increase or decrease. From the point of view of marketing, gold is an excellent asset. Regarding investment highlights, it is not very profitable. Investors consider gold as a protective asset. US Treasuries (UST) is its competitor. UST generates periodical income in the form of coupons; gold does not generate income. The investor can earn after price increase only. So it is more profitable to buy UST and receive coupons. But if real riskless income is negative the situation is changed. This occurs if dollar inflation is more than yield-to-maturity UST. The chart shows gold price increases in 2008 and 2011. At these points, dollar interest rates were negative. 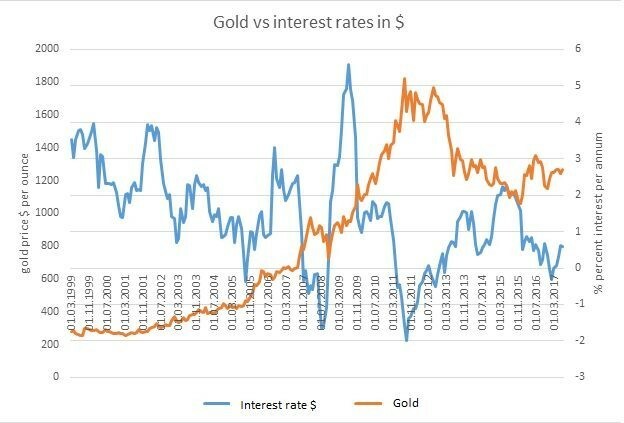 When dollar rates were increased in the USA, gold performance changed. The USA inflation target regarding FRS is 2%. Ten year benchmark income is 2.2%. Inflation as at July 2017 is 1.7%. 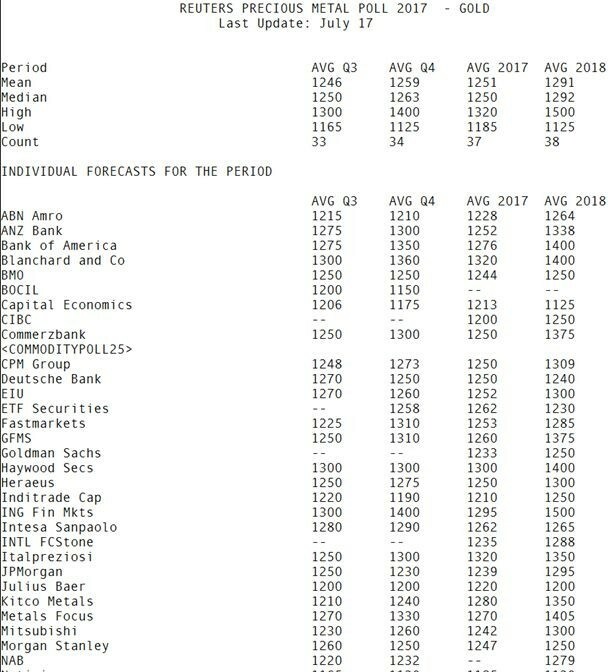 So actual rates are to be positive. As a result, gold prices will not increase. In spite of that, the price of gold could increase in the short term. If Donald Trump’s competence is seen as decreasing or less reliable, the American stock exchange market state can change correspondingly; the situation could be worse than in 2008. If the American market defaults other markets will fall down, too. As a result, investors will try to liquidate possible risks. Precious metals will be the best instrument for investments. The HelloGold company staff consists of professionals who are experts in investment infrastructure. One of the representatives is Robin Lee, CFO. Robin was a Principal Accounting Officer at the SPDR Gold Trust mentioned above. Other staff members have occupied leading positions at the Royal Bank of Scotland, Deloitte, and AEON companies. Roger Ward is a co-author of the development scheme for the World Group Council, but we did not find information on him on the company website. We did not find any negative information about staff members; neither did we find any information on their participation in other ICOs before. The target audience for the project is anyone not able to purchase gold bullion or to buy gold on the financial markets. It intends to serve the consuming middle class and the emerging middle class. According to the data given in the whitepaper, there are almost 448 million people in ASEAN and China. HelloGold’s research states that in 2016, their total savings were $505 billion. This amount includes currency deposits at $212 billion. 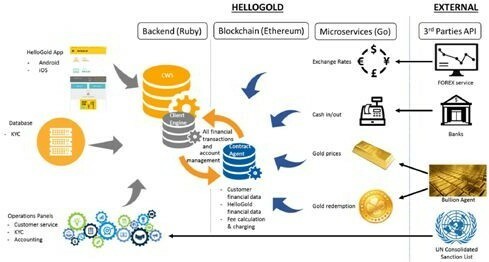 The company is working with financial instruments, mobile providers, and other companies whose clients are the potential target customers of HelloGold. The first project partner is the AEON Corporation, one of the largest companies in Japan dealing with consumer credit. It has established branch offices in Hong Kong, Malaysia, Thailand and other countries in the Far East. AEON provides a database of more than 100 million potential users in Asia; besides that it finances loans, secured with HelloGold’s gold. The founders state that HelloGold is the first Shariah-certified digital gold scheme that meets the standards of the Accounting and Auditing Organization for Islamic Financial Institutions (AAOIFI) as to gold investments and crediting. This is a serious advantage for a company planning to operate in the developed Islamic financial market. The staff have not promoted the company heavily among cryptocurrency community representatives. ICO promotion is poor. As for August 25, 2017, there are only 18 comments on Bitcointalk.org discussions. They are all written within a month. Maybe this is due to the absence of a bounty program, or that the team is not interested in ICO popularity. Twitter has 215 followers; Slack, 310 followers. There are 808 likes on the company’s Facebook account. Besides that, if we query «HelloGold» on Google we will not find any publications by well-known cryptocurrency news makers. Nevertheless the Project raised $1,000,000 during its pre-ICO. Among the participants was the Fenbushi Capital Fund, whose founder is Vitalik Buterin. Another co-founder of this fund, Bo Shen, became an advisor to the project. Gold purchase is a very popular instrument with which to store savings. It is a popular service offered by banks, brokers, and exchange-traded funds. We can compare HelloGold with the SPDR Gold Trust; the CFO of the project worked for this company. HelloGold buys gold through his contractor; the SPDR Gold Trust buys gold in LME. Both companies store gold in secured safes. HelloGold’s gold is more expensive than ETF GLD shares; the transaction fee is 2%. The brokerage average charge is 0.1-0.2%. Management fee is 2% per annum, and the competitor’s one only 0.4% per annum. In addition, the investor pays for HelloGold’s service. He gets the chance to invest small amounts using a simple smartphone application. There are several active blockchain companies in the market similar to HelloGold Among them are OneGram, Goldmint, and Digix. Of course there are distinctive features and similarities. The OneGram project’s founders assure that they meet Shariah certified digital gold scheme standards. In our opinion the financial model of the HelloGold project is planned better than those of the above-mentioned companies; the staff is more professional and has greater experience as well. The founders of Singapore’s Finlab accelerator programme – a joint venture between SGInnovate and United Overseas Bank rated the project at top level. They invested in the project at the beginning of their development. We believe the tokens will be adopted on the gold market. Cryptocurrency investors will appreciate GBT token adoption highly; it gives them opportunity to cash out and exchange into stable currency secured with physical gold within the cryptocurrency market. If cryptocurrency volatility increases, GBT tokens are listed with the performance in accordance with the secured assets price. HelloGold is one of the best projects we have ever examined as to the possible risks. We have not found problems in either technological or the conceptual parts of the project. The only problem could be legal restrictions, but legal risks are inherent in all cryptocurrency projects. 1.2 Malaysian ringgit - replenishment (about $0.28 at current rates). 2% from the gold purchase/sale transaction value. 2% annual management fee. This charge is calculated daily and deducted monthly. 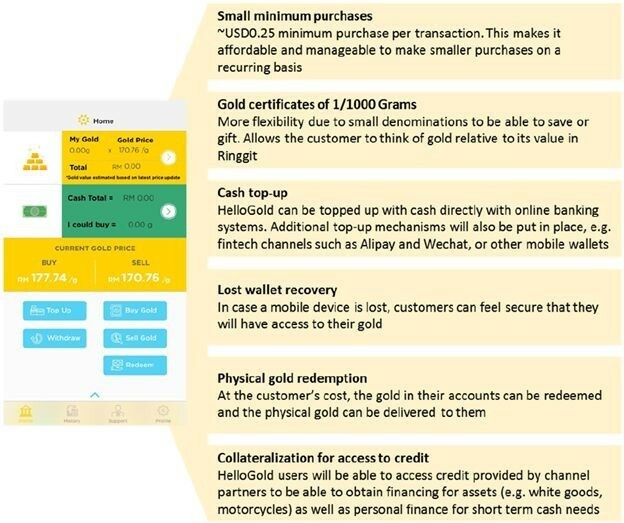 If the user obtains credit secured with gold, HelloGold receives 2-3% of the debt amount; the charge is paid by the creditor. The user does not have to pay the annual management fee in this case. Cashing out is not liable for charge payments. HelloGold estimates its expenses at: 0.79% of the gold purchase transaction value; 0.5% of the gold sale transaction value; and 0.39% per annum, the cost of gold storage and insurance. It is interesting why the purchase and sale costs are different; project members explain the reason is due to the BullionStar International contractor’s policy. There are no charges amounts available on www.bullionstar.com. HelloGold’s founder has assured us, in our discussions on Telegram, that the transaction price will be at spot+2%. This means the contractor’s charge does not influence the transaction price; the company bears this risk by itself. This can influence the project’s financial results, but we do not think they will bear a strong economic risk. The model is implementable and the charge is competitive. We question the lines “No. of Savers” and “Gold under management”. The founders do not explain the sources of their figures regarding number of clients and average amount. Taking into account the experience and professionalism of the staff, we would like to believe their forecasts. One client profit is 4%. The HelloGold founders do not foresee a possible exodus. Anyhow, an exodus is profitable for them as well; transaction fee is 2%. We should repeat that the financial model of the project can be implemented; we have not found any serious risks for token holders. The documentation takes legal matters into account. To avoid tokens being classed as a security by the Singapore regulator, the founders do not promise HBT token reward distribution. They say: «Distribute GBT to HGT holders at its discretion». We asked what does «at its discretion» mean. They explained it means hedging the risks of regulator reclamation. It should be taken into account that the founders do not promise to pay the investors, and that they could in theory explain the above mentioned word combination in a different way in future. Any increase in the underlying gold’s value. In our opinion and also according to Reuters’ forecasts, the average gold price increase is limited with 1-2 years. Nevertheless, token rewards depend on AUM increase. The HelloGold founders promise 10% fees paid by platform users for HBT token holders, with the transfer of GBT tokens secured with gold. (taking into account the aforementioned information concerning possible rewards.) The project members assure that investors will have their funds invested in the ICO increased by 5-6 times. 3.8 million grams of gold are intended to be distributed in total if one gram of gold is $40 at the relevant date. Distribution of 3.8 million grams of gold takes place over 8 years. According to HelloGold’s forecasts, AUM will grow exponentially, and the gold price within the first five years is constant; so they will set dividends at 13% of 3.8 million grams of gold. Another part, 87% of the total gold volume, is set within the period from the sixth till the eighth years. They plan to increase reward within the first five years utilizing new secured tokens including silver, platinum, and so on. In fact this is an additional token price increase driver not included in the given plan. So, taking the above information into account, the HGT token will be profitable only after 4-5 years increase in rewards. Nevertheless, taking into account a successful pre-ICO, the project’s qualitative elaboration, and the characteristic features of the cryptocurrency market, we recommend HGT token purchase during the ICO. We believe the demand will be high and that tokens will be profitable for speculation purposes. The information contained in the document is for informational purposes only. ICORating received monetary compensation in the amount of $6600 from the entity rated in this report for completing the ratings report. However, the entity rated in this report did not have the opportunity to approve this rating report before the report was published, nor did the rated entity have the opportunity to edit or remove this report once it was published. The views expressed in this document are solely those of the ICORating Team, based on data obtained from open access and information that developers provided to the team through Skype, email or other means of communication. Our goal is to increase the transparency and reliability of the young ICO market and to minimize the risk of fraud. We appreciate feedback with constructive comments, suggestions and ideas on how to make the analysis more comprehensive and informative.